Google Calendar for iOS launched today, and the app is available for free from the Apple App Store. The "official" Google Calendar allows you to see your schedule with maps and photos of the places you're going. Information from Gmail like flight, concert, restaurant and hotel reservations are automatically added to your calendar. Entering events can be accomplished quickly and easily, and you can switch between viewing a single day or multiple days. Google Calendar will work with the other calendars you have on your iPhone. Based on the reviews from those who have already downloaded and installed the app, it appears that there is no support for landscape mode. No doubt that Google will add this capability in the near future via an update. Meanwhile, there are a number of iOS users who have been patiently waiting for this app to appear. 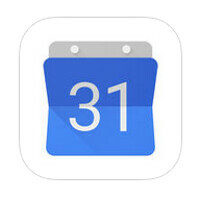 Google Calendar joins other Google apps for iOS including YouTube, Google, Google Chrome Browser, Gmail and YouTube Kids. Microsoft and Google; Let's bury the hatchet,, we smok'em peace pipe.